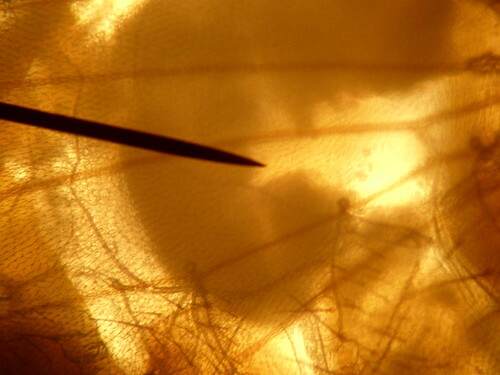 I've noticed that not all plant cells are the same. 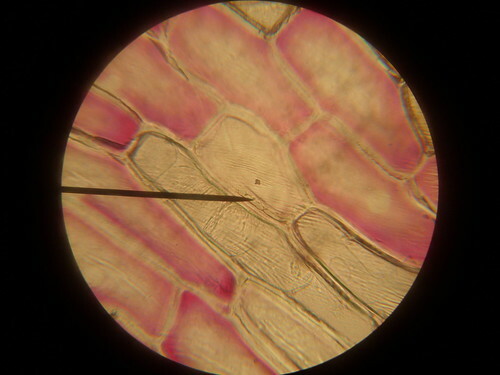 Some plant cells, such as onion cells, have that rigid shape that you see in text books; but some other plant cells such as duckweed cells have a more rounded shape. 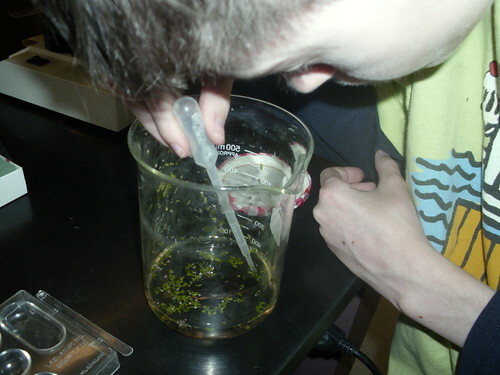 The duckweed cell walls are thick, but they aren't rectangles, like the cell walls of the onion cells. 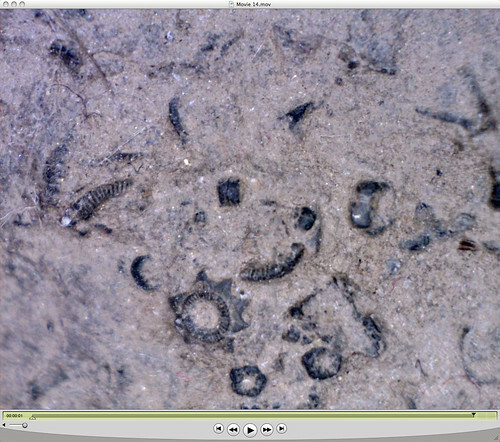 I looked at little bits of different creatures that were fossilized in a rock I found in the cliffs at a park on the Lake Champlain shore in Essex, New York in summer. 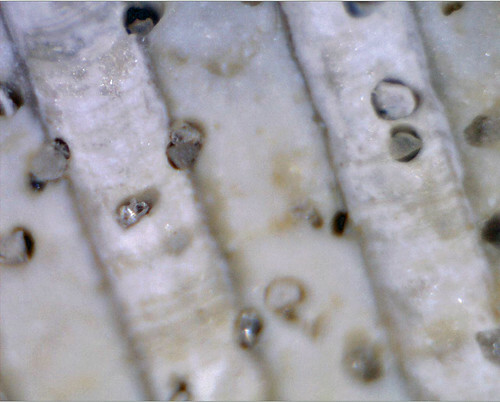 [MAP] We think the magnification on these microscope images is about 40X. 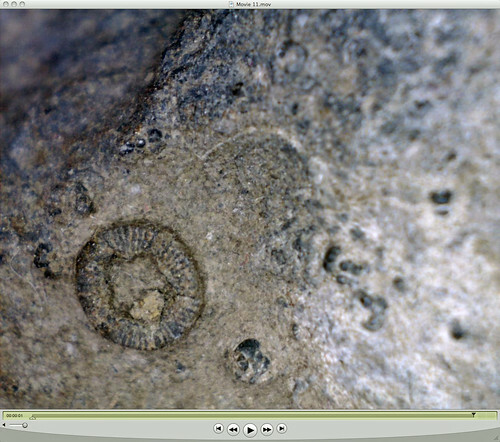 The circular thing in the first image is part of a tube worm shell, I think. I'm not sure what this is, but the thing in the middle looks either like a backbone, or another tube worm shell. I'm not sure what these pieces are. They seem to be part of tube worm shells and some other things, maybe plant matter. 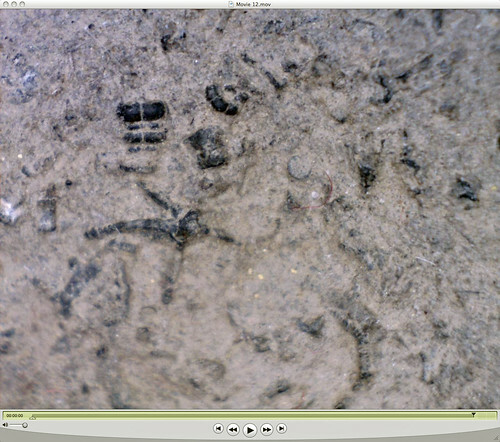 This one looks like its got a tiny sea star in it and also bits of coral. 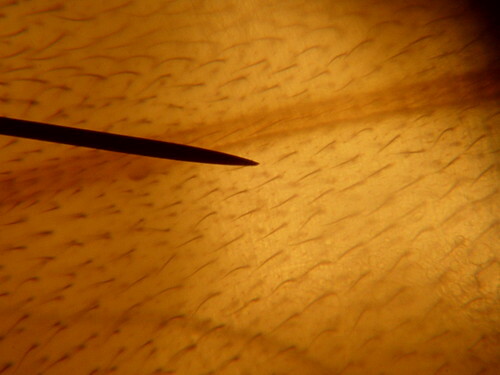 After that we could use the microscope with Photo Booth. 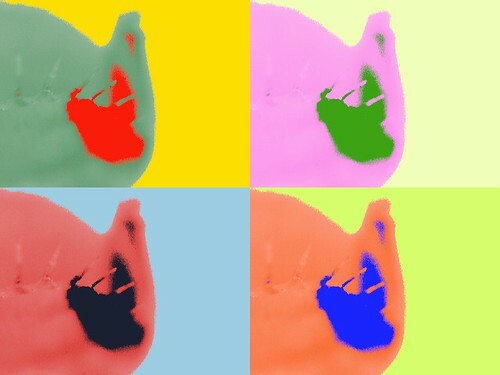 That was cool because Photo Booth has a bunch of special effects (see last post). But we still get picture at only 640 X 480, which wasn't big enough. 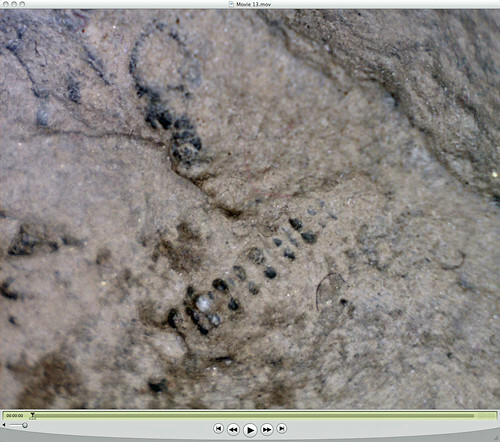 My mom fiddled around with QuickTime, which in principle should be talking to the microscope if we got Photo Booth to work. She found a menu that helped: QUCIKTIME > PREFERENCES > RECORDING. 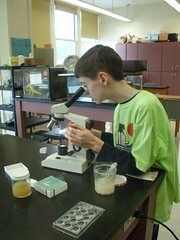 The Video Source needed to be set to "Celestron Digital Microscope." The Qulaity needed to be set to "Device Native." Then we could record at 1.3 megapixels. Then we can record video through QuickTime and the video comes out as 1280 X 1024 video, which is the size of image we want. The only problem is that you get a video rather than a still image. The solution to this (so far) is to stretch the Quicktime playback window out to full size, and use Preview to make a screen shot of the window. I still might need a small bit of help with it right now because this process is more complicated than I'm used to. But once we have the pictures we can put them in other programs, such as Corel Painter, and adjust the light and color tones in the picture. So this is a lot better than just 640 X 480 with some special effects. Here is a picture from this morning of a shell that I picked up at the beach a while back. 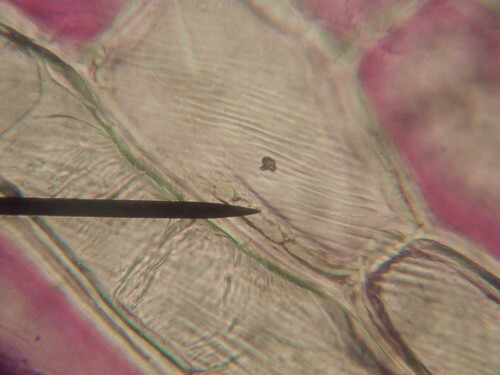 We looked it under the microscope. We were surprised to find these tiny shells attached to it instead of just little holes. the tiny shells seemed to be inside holes on the big shell. Some them look like clams and others of them look like snail shells. We never knew they were there before. I got a Celestron 44302 digital miscroscope for Christmas. It works pretty well, too, although we've only got it connected to Apple Photo Booth so far, and so the pictures are only 640 X 480 pixels until we get that fixed. Photo Booth has lots of special effects which I worked with on some of the pictures. 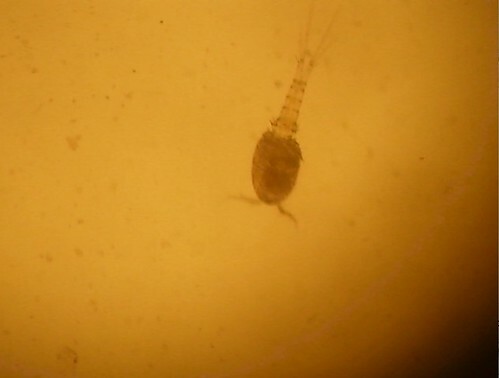 I am looking forward to taking more pictures once we figure out how to get the 1.3 megapixel pictures we are supposed to be able to get with this microscope. One megapixel is 1,000,000 pixels. And 640 X 480 pixels = 307,200. 1.3 megapixels is 1,300,000 pixels. And so, to find out hom much bigger the pictures are that we are supposed to be able to get, we divide 1,300,000 by 307,200, and we get about 4 1/4. And so the pictures we should be able to get are 4 1/4 times bigger than what we are getting now! The reason we are having a problem is that the computer isn't recognizing the microscope except when we use Photo Booth to get at it. It comes with software for Windows, but is suppsed to work right out of the box with Macintosh, which it doesn't. 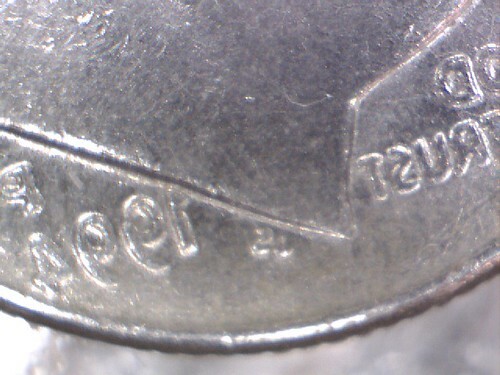 This is a picture of a dime, but the letters are backwards because of the lenses in the microscope. 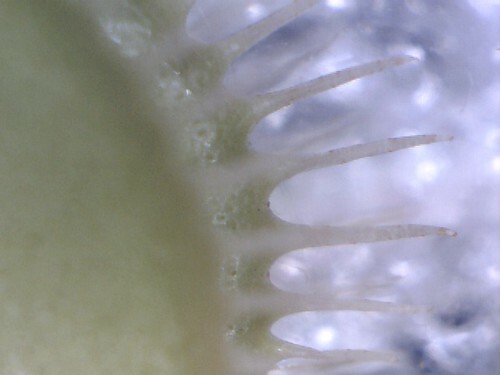 The Warhol effect used on the stem end of the Venus Fly Trap. 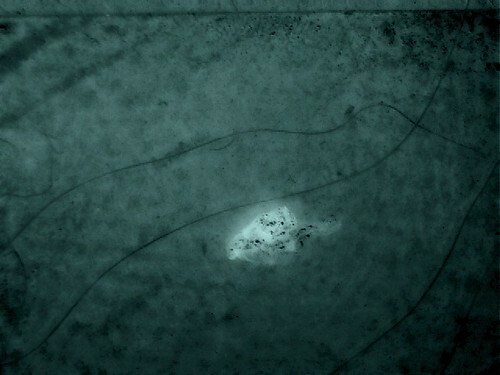 This is a picture of a flea stuck to a piece of tape using Photo Booth's x-ray effect. 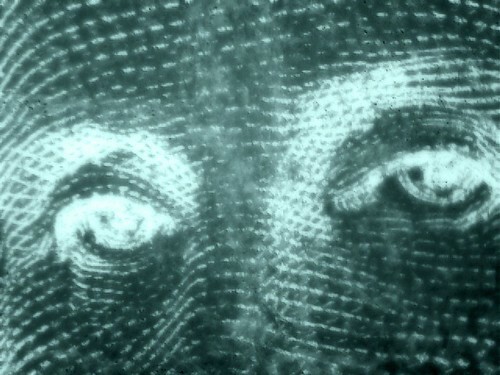 Here are George Washington's eyes on the dollar bill, using Photo booth's x-ray effect. 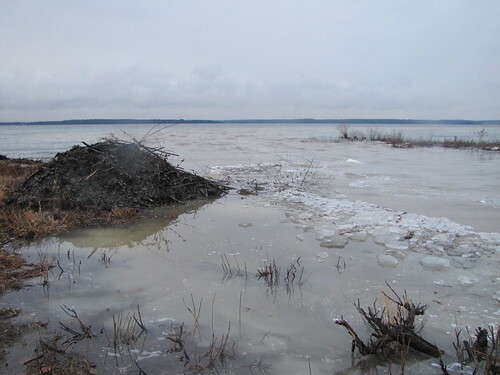 It snowed a lot today and now the beaver lodge is covered in snow and surrounded by ice. Today we took my puppy for a walk but ended up taking my cat for a walk, too. 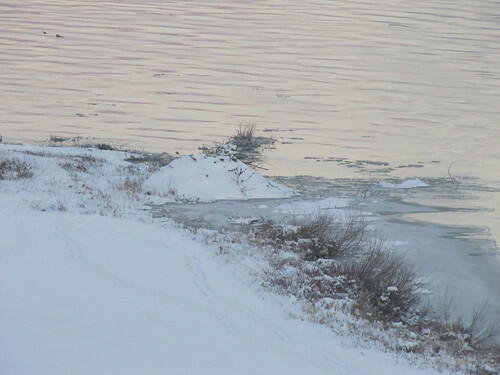 There seemed to be an area next to the Beaver lodge where the mud had been dug away from the bank. 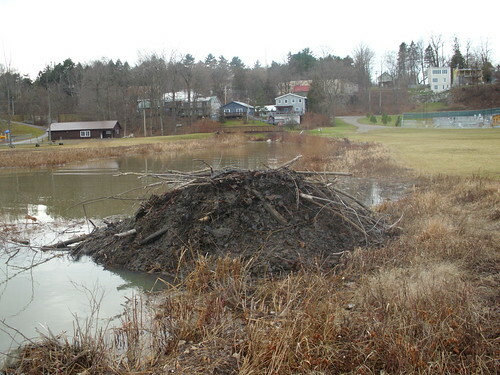 It looked like the beavers had used the mud from the dug up area to pile on the beaver lodge. The water was very high because it has been raining. The beaver lodge was very wet. 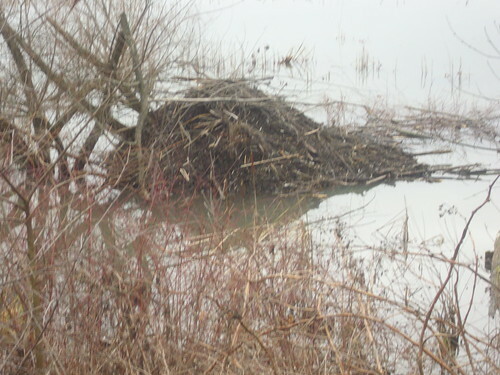 The beaver lodge seemed like it had been soaked all over from the rain. There was also some ice by the edges of Hoisington Brook because it has been getting so cold in December. From our livingroom we can see that there is a strong current leading a lot of the mud out into the lake and around the shore to the right. 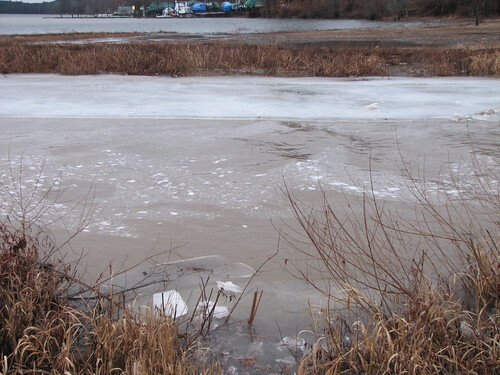 From the way the ice has formed on the surface, it looks like there is a partial beaver dam at the mouth of Hoisington Brook. Next to the beaver lodge there are branches with beaver tooth marks on it. 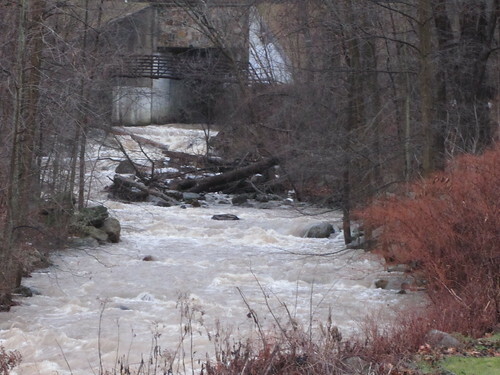 The Brook is very brown and muddy right now and the current is rushing. I think there is ice on Hoisington Brook because it got down to 1 degree F a few days ago. I. 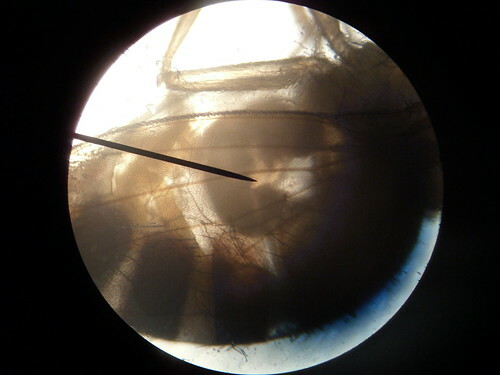 In Mrs. Loher's room I looked through the microscope at some of the water from the tank with the water bug. 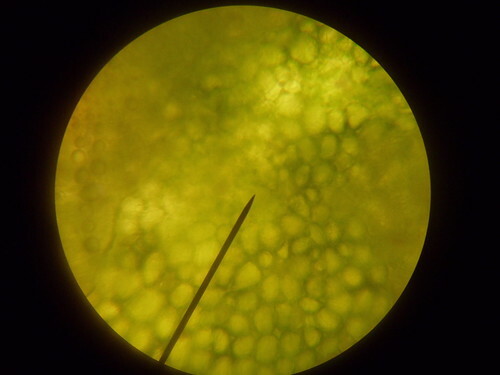 At first I had the microscope focused so I could see the cells of the duckweed which looked like -- instead of being squares -- they looked like circles. And then I noticed that whatever the little creatures were in the water, they could somehow move around through what looked like jet propulsion and had small little tails. I could faintly see what looked like their internal organs, but it was kind of hard. II. There are two beaver lodges by my house. One is right by the mouth of Hoisington Brook, and the other is in a swamp out back of and old red house near us. We can see the one by the brook from our living room. The one by the brook washes away sometimes when the brook gets too strong. Last spring I saw one of the beavers probably from the swamp over by the marina. I have also seen muskrats and minks and many other creatures near the marina.